This has been on our stove day after day lately. I'm a bit addicted. We still have tomatoes growing, and our dried basil might even be better than the fresh. With New Mexico's Hatch green chili to add just the right kick, this it the perfect breakfast (or lunch or dinner)! 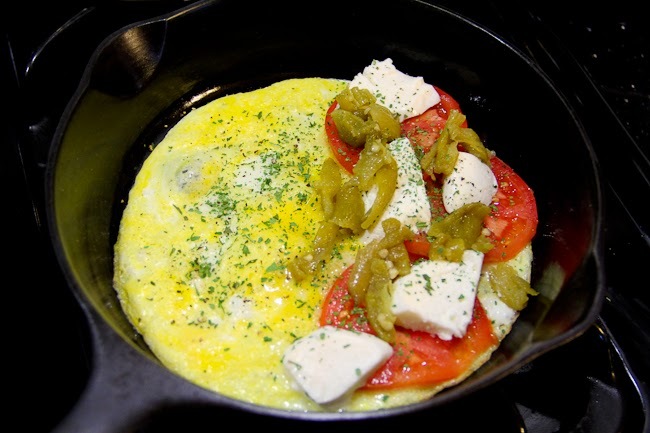 Not much to it really, just a couple of eggs, a few slices of tomato, fresh mozzarella, green chili and basil in a cast iron - voila! I may have just licked the computer! (Ha!) That looks so delcious! I just happen to be heading out to the grocery store tonight and am adding all ingredients to my list. Thanks! That looks positively amazing! I love Hatch green chili season! Genius. Pure genius. That looks amazing. So many good things in one skillet. You need to open a restaurant. Seriously.